I love nothing more than cooking with the kids in the holidays, it’s our time to test out new recipes so I know what to pack in their lunch boxes that won’t come home. This week whilst doing the groceries with the cherubs a few too many punnets of strawberries ended up in our trolley. So I went in search of a new recipe for their lunch boxes and found this loaf at the Stay at Home Mum’s website. The kids popped on their aprons and measured, mixed and poured and of course had to have the traditional mixture taste test. Once it was out of the oven there was not enough time to let it cool down and it was yummy. 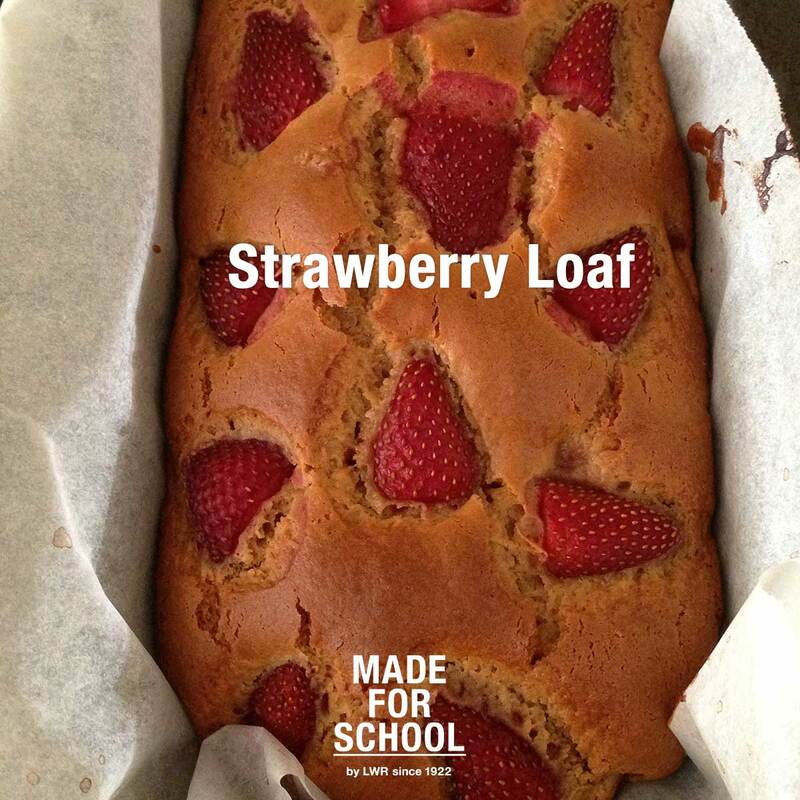 I think we’ve found another lunchbox treat recipe to add to our Rainbow loaf and other collections. Wash the strawberries and pat dry. Thinly slice half of the punnet and cut remainder into halves. Lightly grease a loaf pan and line with baking paper. Preheat oven to 170 degrees. Place sugar, oil and egg in a medium mixing bowl and beat on high for 5-8 minutes until thick and creamy. Fold in flour and alternately with the milk then fold in the sliced berries. spread mixture into the prepared pan and top with the halved strawberries. Bake in the preheated oven for 55 minutes to an hour or until cooked in the centre. Stand in the pan for 10 minutes then turn onto a rack to cool. Can be stored in an airtight container in the fridge for up to 3 days, or slice and freeze for up to 2 months. Now I have to make another loaf so that I can freeze it and have a treat for the kids lunch boxes in a few weeks time.